The aurora borealis is also known as the northern lights. This occurs in the sky of the northern hemisphere. (The same phenomenon occurs in the southern hemisphere, where it is named the aurora australis.) The aurora borealis is a glowing or flickering light of natural origin which is sometimes seen at night in the sky. In addition to the sun’s radiation, cosmic rays from outer space come pouring into the atmosphere. They create secondary radiations and electrified particles. Some cosmic rays fail to get through the atmosphere. The more penetrating ones traverse the entire thickness of our blanket of air and reach the earth. A large amount of meteoric matter is always falling through the atmosphere. The smallest pieces are no bigger than grains of dust, but they plunge into the atmosphere at speeds of 25 or more miles per second. The atoms of all elements (except hydrogen) are made up of at least three smaller particles, which are protons, neutrons and electrons. The largest of these are the protons. The hydrogen atoms ejected from the sun have lost almost all their electrons, so only the protons are left. These are shot out of the sun at speeds of over 500 miles per second. When the protons strike atoms in the upper atmosphere of the earth, these atoms gain energy and radiate. The aurora is caused by rays or electrically charged particles shot from the sun, which are diverted toward the earth’s atmosphere and change their electric charge. They glow much like the charged particles that cause the glow of a fluorescent tube – from fiction with the air particles. The aurora is always present in almost every area of the sky. But, it is usually too faint to be seen except near the north and south poles. The northern lights can not usually be seen anywhere until around midnight. At this time, the lights are far down in the sky. Soon, curved bands of light appear above the glow, and beams begin to shoot upward toward the middle of the sky. The beams keep changing their positions and brilliance from second to second. At its full intensity, the aurora covers the entire sky with shifting curtains of light like draperies waving in the wind. These lights seldom occur less than 50 miles above the earth and are sometimes as much as 600 miles high. The light display of the aurora is greatest at times of magnetic storms. Displays are most frequent around the time of the greatest sunspot activity. Another effect of the protons striking the atoms in the atmosphere is the interference with radio, television and telegraph reception. This is because, where spots in the atmosphere are disturbed by the protons from the sun, the atmosphere no longer stops the signals and bounces them back to earth. They instead travel straight out to outer space. Magnetized needles suffer disturbances in their normal direction which cause them to deviate generally from the west first, afterwards to the east. The current from the aurora borealis comes in waves which increase and decrease. Each wave is between 15 and 60 seconds. If one wave is positive, the next is negative, and so on. When the aurora is emitting a positive wave, the current on the line increases, and it neutralizes a battery totally when a negative wave is emitted. 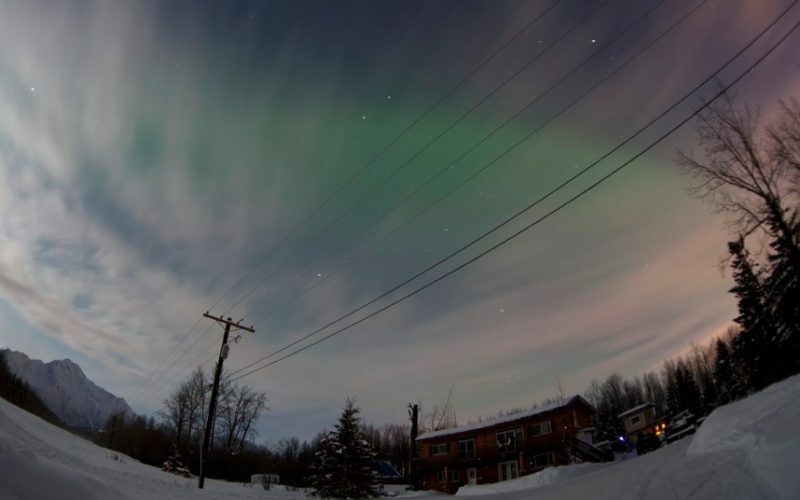 A man named Matteucci had the opportunity to observe the magnetic influence of the aurora borealis. During the appearance of the aurora borealis on November 17, 1848, the soft iron armatures employed in the electric telegraph between Florence and Pisa remained attached to their electro-magnets, as if the latter were powerfully magnetized, without, however, the apparatus being in action and without the currents in the battery being set in action. This singular effect ceased with the aurora, and the telegraph, as well as the batteries, could again operate without having suffered any alteration. In England, a man named Highton witnessed a strange event at the same time. The magnetized needle was always driven toward the same side, even with much force. It is in the United States, however, that the action of the aurora upon the telegraph wires was the most remarkable. A fantastic aurora occurred in September of 1851. This took complete possession of all the telegraph lines in New England and prevented any business from being transacted during its duration. The following winter, on February 19, 1852, another aurora left its mark in history. On this date, the system of telegraphing used upon the wires was Bain’s chemical. No batteries were kept constantly upon the line, as in the Morse and other magnetic systems. The main wire was connected directly with the chemically prepared paper on the disc so that any atmospheric currents were recorded with the greatest accuracy. The usual battery current, decomposing the salts in the paper and uniting with the iron point of the pen-wire, left a light blue mark on the white paper. Or, if the current were strong, a dark blue mark would be left on the paper. The color of the mark depended upon the quantity of the current upon the wire. The aurora of August 28, 1859, is said to have rendered lines useless for all business purposes throughout the entire northern portion of the United States and Canada. So strongly was the atmosphere charged with the electric field, that the lines or circuits of only 12 miles in length were so seriously affected by it as to render operation difficult and, at times, impossible. Before this aurora could be seen with the eye, the line between Boston and New Bedford, which was 60 miles long, could only be worked in intervals. The wire between Boston and Fall River had no battery hooked to it on that day because it was a Sunday. However, there was enough current available to the wire to have worked the line. Mrs. O.S. Wood, the superintendent of the Canadian telegraph lines, gave the following account in the 1800s. The auroral current can also be used for transmitting and receiving telegraphic dispatches. This was done between 8:30 and 11:00 in the morning, on September 2, 1859, on the wires of the American Telegraph Company between Boston and Portland, and upon the wires of the Old Colony and Fall River Railroad Company between South Braintree and Fall River, among others. The length of time during each positive wave was only, however, 15 to 60 seconds. The following account came from between Boston and Portland. This went on for a period of two hours. After the current from the aurora subsided, the battery was reconnected. The parties at Fort Braintree and Fall River did the same for over an hour, over a distance of 40 miles. The following accounts are from the American Journal of Science – January, 1860.